Nothing says spring better than a rich, smoky barbecue aroma wafting on the breeze, but is your grill up to the task? After a long, chilly winter stored away, your gas grill may need some fine tuning to be ready for the tastiest spring and summer grilling. Remove all grates and scrub them thoroughly, removing any leftover bits of food, grease and ash. Pay special attention to corners and joints, and let the grates dry thoroughly before reinserting them. Carefully clean burners and check that there is no grease or ash clogging fuel ports. Consult your owner's manual for how to safely and easily disassemble burners for easier cleaning, and take great care to reassemble them correctly. Clean the inside of the grill box and drip pan to remove any lingering odors that may taint tastes as you start to grill again. Clean the exterior of the grill and repaint it if desired, using a rustproof metal paint to make your grill look its best for the season. If your grill is stainless steel, use a specialized cleaner to preserve that lustrous finish. Inspect all hoses, valves and wires to be sure there is no cracking, fraying, flaking or other damage or decay. Check that all connections are firm and secure without leaks. Tighten loose bolts and screws on all handles, legs, hinges and wheels so there is no risk of the grill tipping or collapsing when it is moved or in use. Check the ignition to be sure it lights properly and replace the igniter battery if necessary to guarantee good reactions for swift, strong lighting. Inspect your propane tank for any rust, bulges, cracks, leaks or other damage, and exchange or replace the tank properly if necessary. Be sure the propane tank is full so you don't run out of fuel when grilling. Consider getting a spare tank to have on hand if you do run out mid-grilling, and store it in a cool, dry place. Check all air vents for proper circulation and air flow to control oxygen to the grill and general temperature control. 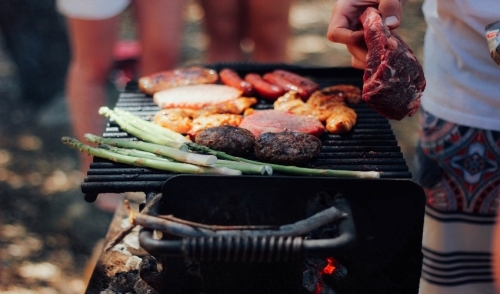 Check all your grill accessories, including tongs, scrapers, trays, foil and other tools, as well as your grill cover. Repair, replenish or replace accessories as needed. Finally, the most important step of all – stock up on your favorite meats, sauces and grillable veggies and get ready to enjoy a delicious grilling season!